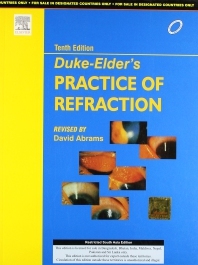 INTRODUCTION; the clinical importance of refraction; REFRACTION AND ITS APPLICATION TO THE EYE; the principles of refraction - general optics; the refraction of the eye - physiological optics; CLINICAL ANOMALIES; part 1: refractive errors. hypermetropia; myopia; astigmatism; sphakia and psyeudophakia; changes in refraction; part 2: accommodation and its disturbances. accommodation; prsbyopia; anomalies of accommodation; part 3: binocular vision and its anomalies. binocular optical defects - anisometropia; binocular optical defects - aniseikonia; binocoular msucular co-ordination - orthophoria; binocular muscular anomalies - heterophoria; binocular muscular anomalies - heteroptropia; binocular muscular co-ordination - convergence; binocular muscular anomalies - anomalies of convergence and other reading difficulties; CLINICAL INVESTIGATION; the place of refraction in general ophthalmological examination; visual acuity;objective methods of refraction; subjective verification of the refraction, and testing of muscle balance; the prescription of spectacles; OPTICAL APPLIANCES; the making and fitting of spectacles; contact lenses; visual aids; APPENDICES; INDEX.INTRODUCTION; REFRACTION AND ITS APPLICATION TO THE EYE; CLINICAL ANOMALIES; CLINICAL INVESTIGATION; OPTICAL APPLIANCES; APPENDICES; INDEX.